ABBA Construction, Inc. is a small business headquarterd in Jacksonville, FL, began operations in 1985. Today, the company is uniquely qualified to design, plan, schedule and complete multi discipline/multi-task general construction and mangement activities. We invite you to view our Projects Area to learn more about the type of work that ABBA Construction performs as well as view our performance history. 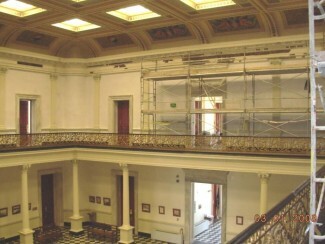 Description of Work: Removal, replacement and abatement of interior plaster and repainting using historical restoration methods; during occupancy.